At the awards ceremony following the Community Heath Network Green Lake Area Half Marathon the race director opened with "Congratulations!" Then he said, "as you know this is not an easy 13.1 miles!" It was hilly but very pretty. There were many areas with shade and sections along the lake. 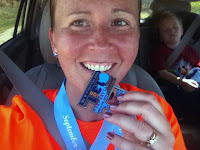 I loved the event size & location, finisher's medal, hat & long-sleeve tech t!